It’s finally here! The fantastic vegan bouillon powder from Australia has reached our store, and it’s definitely one of the best bouillons we’ve tasted. Made with all natural ingredients, these vegan bouillon powders are animal-free, do not contain any added MSG, and are also gluten-free as well as Kosher. Make incredible soups and stocks with this powder, but that’s not all it’s good for – you can also sprinkle it on veggies, season your stir-frys, use as a BBQ seasoning or rub for meat alternatives, or use it as a salt replacement that’s full of zip! 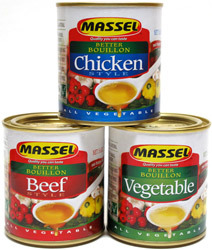 Better Bouillon is available in 3 flavors – Beef Style, Chicken Style, and Vegetable. 4.4 lb. bulk canisters are $48.99 each. From Maria Bruno of Lombard, Illinois on 12/26/2013 . My husband used this without me knowing (even though I was the one that used it). He had made some rice with it and I ate the rice and took one bite and thought "OH NO, I just ate chicken broth!!! !, NO NO NO!) and then he told me what it was. Coming online to buy more because now he, the meat eater, said it's good and will use it instead!! From Jerry of Cleveland, Ohio on 7/15/2013 . Very tasty. I use the "chicken" flavor bouillon to make a quick "chicken rice soup" (in addition to bouillon powder, I place a little TVP (provides "chicken" texture) and cooked rice in a cup before adding boiling water). I use the "beef" flavor to make an onion broth (in addition to the bouillon power, I place some onion powder, cooked onion and soy sauce in a cup before adding boiling water). I add the vegetable powder (plus soy sauce and garlic powder) to the cooking water to flavor rice. Good stuff. From Carole Roussy of Chandler, Quebec on 7/11/2013 . Is the 349 mg of sodium for the whole jar or for the tea spoon ? It seems like a whole lotta salt ? From Jamie of Slidell, Louisiana on 7/11/2013 . I bought the beef one and made some cabbage soup, it was super awesome! I've used it in many things and it never disappoints. Can't find anything comparable at the local stores. From Josh D of Rock Hill, South Carolina on 5/25/2013 . I ordered all 3 flavors (beef, chicken, vegetable). I have made a "beef" stew, "chick'n" noodle soup and oriental veggie soup with these boullions. They are all really great tasting. The one that I had the least interest in when ordering was the vegetable flavored one, but that has ended up being my favorite. It has such a rich, clean solid flavor, it's not just good in soups. I used it in a stir fried rice dish today and was drooling for more. The price is extremely competitive, especially considering it's coming from overseas. On my next order, I'm going to stock up heavily on these broths. The stuff sold in my local stores are ok, but they aren't nearly as good as Massel.